Starting in 2018 we introduced the Shop Floor at SOLIDWORKS World. It was an experience to showcase the digital and physical manufacturing workflow and enable people to see how designs become a reality based on a typical manufacturing process. The response from attendees was overwhelming as they were able to see first-hand how SOLIDWORKS can positively affect efficiency and productivity in manufacturing. Based on their feedback, we have expanded our shop floor in 2019 to include more of the design process and the next step of managing the manufacturing process. Let’s start with the design. This year we are building a serpentine drive system for a Small Block Chevy engine. Our first step was to scan an engine to get the necessary dimensions and clearances. We worked with Computer Aided Technologies to educate us on the scanning process and SOLIDWORKS integration from CreaForm. Watch videos on this process here. We have five videos showcasing the method of scanning and processing that data into SOLIDWORKS. Our next step was to identify the accessories on the engine. This engine will end up in an old hot rod, so it needed power steering, air conditioning, and of course, an alternator. For the air conditioning, we reached out to SOLIDWORKS customer Old Air Products and Scott Heto, the Engineering Manager provided us with the correct compressor for our application. The power steering pump and alternator were spec’d based on the year of hot rod and electrical needs. The water pump is reverse flow, and the tension is a stock GM tensioner found at a local parts store. Once the components were selected it was time to start placing the parts and building the brackets. 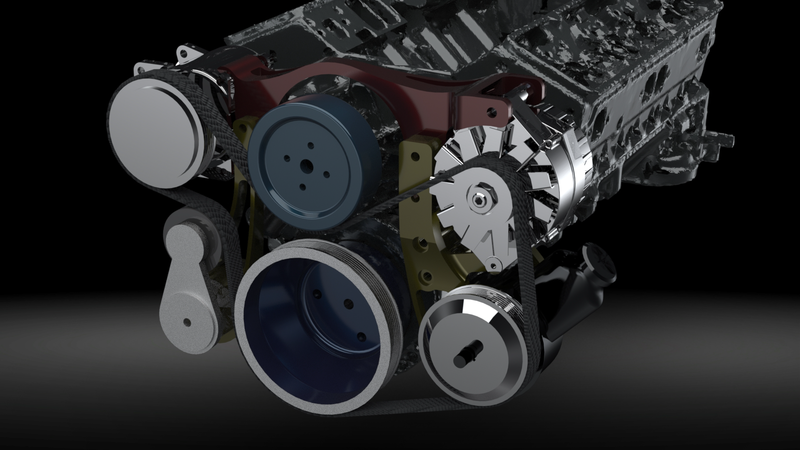 Using our normal design process, we worked with clearances, features, and multi-bodied parts to make the system fit as tightly as possible without causing clearance issues in the engine bay. After all the components fit we move on to optimizing the main bracket through the use of Topology Optimization. This allowed us to understand where we could make design changes to simplify the manufacturing process without sacrificing the longevity of the part. 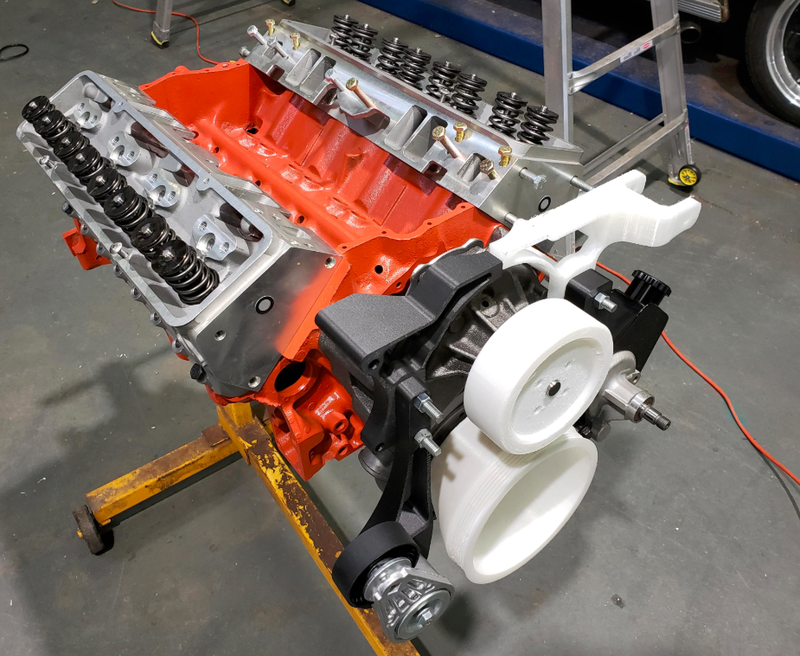 Our next step was to test fit our design on the real engine using 3D printed brackets. This offered us a chance to check fits, and get an authentic look and feel for how the system was going to fit as it relates to the engine bay. With our design completed and verified, we moved on to planning our manufacturing process. The shop floor this year will consist of four CNC machines and three inspection processes monitored by DELMIAWORKS IQMS Products. It is an exciting time to stop by the shop floor and learn about how all of your manufacturing processes can be enhanced by leveraging your SOLIDWORKS design and controlling your business with DELMIAWORKS IQMS Products. Oh and to see a cool design made with SOLIDWORKS! I look forward to seeing you at the shop floor 2019. Michael Buchli has 20 years of design and manufacturing experience throughout the Midwest ranging from Aerospace to recycling systems. A number of those years were spent learning and understanding workflows and processes to improve efficiency and productivity. From running CNC equipment to welding and painting Michael has been hands-on in all aspects of bringing products to market. Michael is also certified in many areas of mfg and a CSWP. He has also written the CAMWorks Handbook.